In this photo illustration, a container of Johnson's baby powder made by Johnson and Johnson sits on a table on July 13, 2018 in San Francisco, California. Johnson & Johnson shares tumbled Friday following a Reuters report claiming the company knew its talcum baby powder contained asbestos for decades. 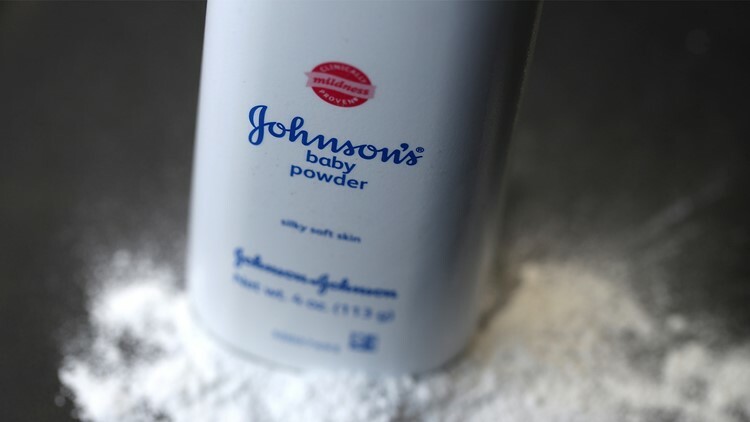 Johnson & Johnson shares tumbled about 10 percent Friday following a Reuters report that claimed the company knew its talcum baby powder contained asbestos for decades. Reuters examined documents, deposition and trial testimonies that showed Johnson & Johnson company executives, mine managers, scientists, doctors and lawyers knew – at least from 1971 through the early 2000s – that the company's raw talc tested positive for small amounts of asbestos, but failed to tell regulators or the public. About 11,700 plaintiffs have filed suit against Johnson & Johnson, claiming its talc product caused their cancers. That includes thousands of women with ovarian cancer. Scientists have long linked asbestos to mesothelioma, which is associated with ovarian and other cancers. Earlier this year, courts in New Jersey and California awarded damages to plaintiffs who claimed Johnson & Johnson talc products tainted with asbestos caused their mesothelioma. In July, $4.7 billion was awarded in total damages to 22 women in St. Louis who said asbestos in Johnson & Johnson talc powder contributed to their ovarian cancer. Johnson & Johnson has consistently maintained its talc is safe. Johnson & Johnson turned over thousands of documents in court proceedings — but most have been designated as confidential, shielding them from the public.